Even the most humble garden tools take on new meaning when you recycle them into creative garden art, so don’t discard that rusty saw or broken spade until you’ve considered more creative options. Check out these six fantastic recycling ideas for old metal tools and discover new life forms lurking in the iron oxide. This cedar fence post stands alone – at the beginning of the farm path – at least, it did, until the farmer cleared out his barn and came up with this array of beautifully rusted implements: a wagon wheel, hammer, keyhole saw, spade, shovel and pitchfork. 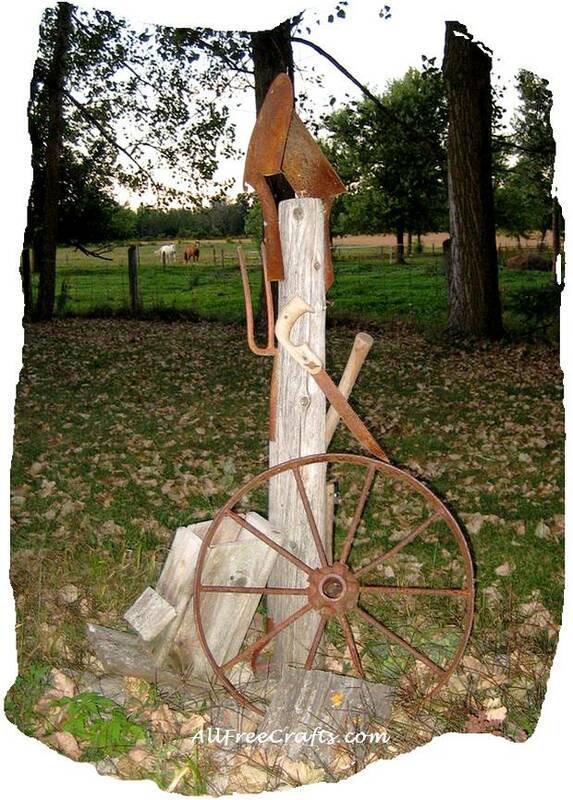 The wagon wheel was propped against the fence post alongside a broken bird house, while the rest of the implements were fixed to the fence post with three inch screws.It’s eye-catching. But it’s also a testament to the work that’s done on the farm. Hard labor, most of it: digging, scraping, hammering, sawing, pitching and moving, all represented in this rustic piece of garden art. 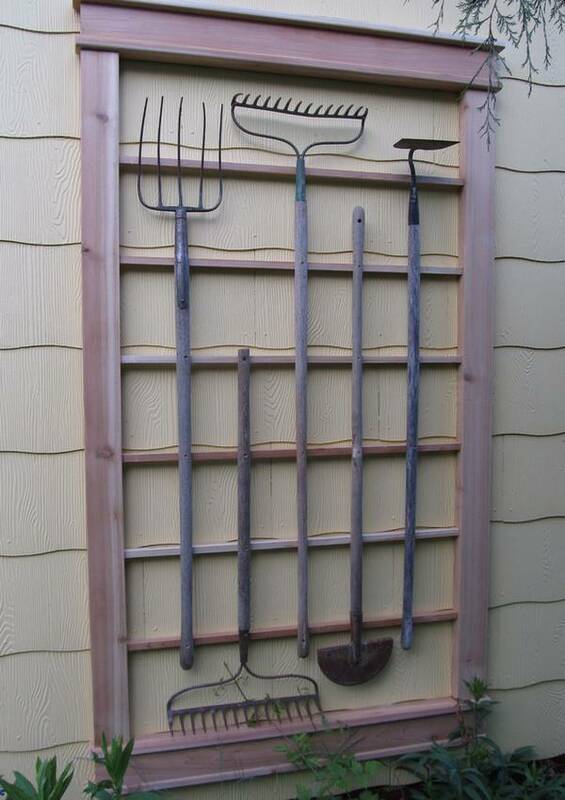 A lawn edger, two rakes, a pitchfork and a hoe all stand together in this practical trellis made from repurposed wood and old garden tools. Created by the recycling gurus at Montana Wildlife Gardener this structure breaks up a boring expanse of siding while also providing sturdy vertical growing space. 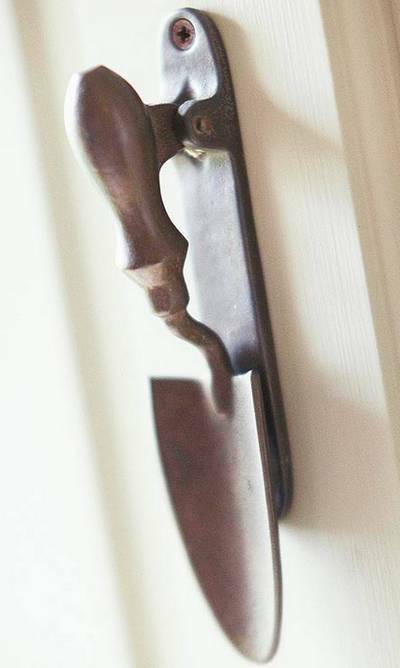 See beauty anew in the polished wooden handle and shaped metal bowl of a sculpted hand trowel, now serving perfectly as a gate or garden shed handle. From The Elements of Cottage Garden Design, a Better Homes and Gardens slideshow. 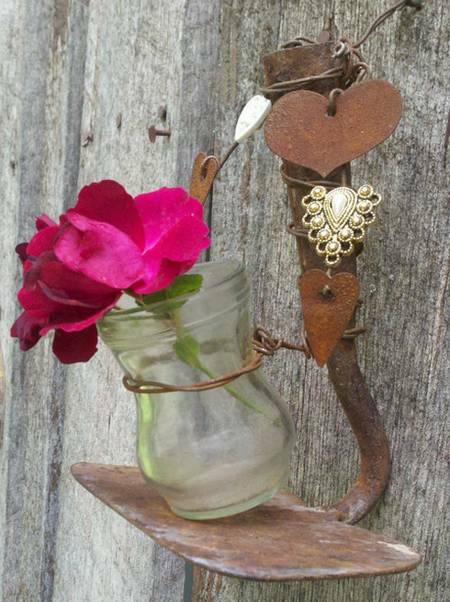 Add a note of whimsy to your garden shed wall or barn door by mounting a rusty hoe (minus its handle) to hold a wired jar vase. Found on Etsy at Rusty Junque (store was closed at time of publishing, but may reopen). Well, you might not have a giant barn wall to decorate, but take some inspiration from this photo of blooming barn flowers, courtesy of GardenJunk on Blogspot. I especially like the sunflower centerpiece made from yellow-painted hand saws. Rustoleum paint is definitely your friend for this project. 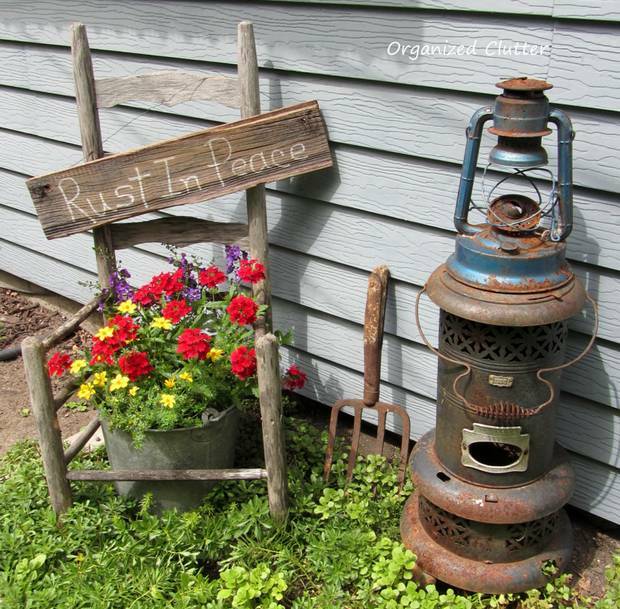 I fell in love with this “Rust in Peace” vignette by Organized Clutter. It takes an eye for the unusual and a love of the unexpected to create something so deceptively simple from a weathered chair skeleton and rusty old stove. But you can copy this idea, as with all the ideas in this post, and make them your own. Rust in peace, indeed.